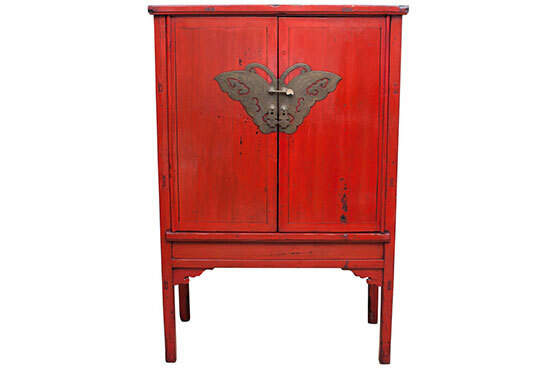 Richly carved, made of camphor tree for its characteristic fragrance or of elm wood for its decorative veining, while cypress wood was privileged for its lightness, the furniture was lacquered, sometimes enhanced with gold, or embellished with elegant and decorative clasps (butterfly or bat shapes). 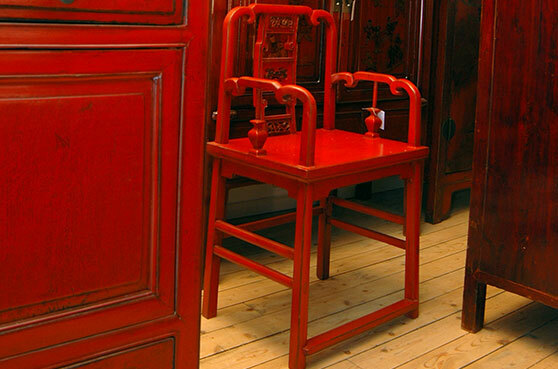 This sophisticated furniture was often more decorative rather than functional. 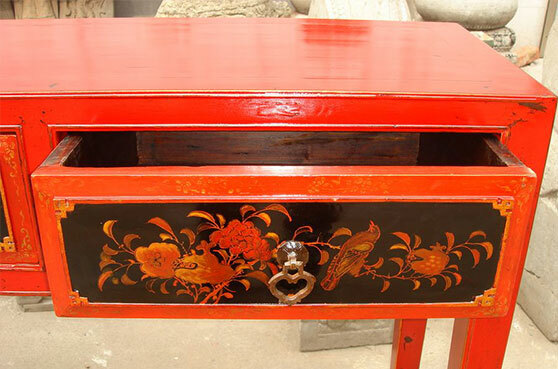 It was decorated with court scenes, flowers or birds. Being unique and highly decorated, the furniture bring a light touch in our contemporary homes and refer to travel impressions and wellness. 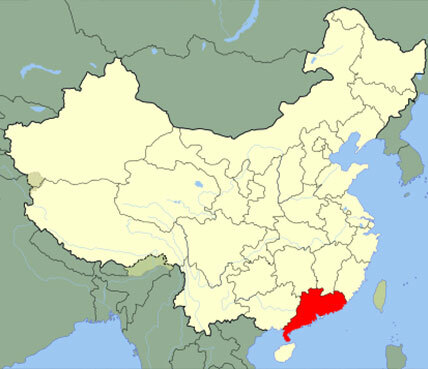 Zhejiang is an eastern coastal province of China, located South of Shanghai. It belongs to the richest provinces and has ca. 56 000 000 inhabitants. 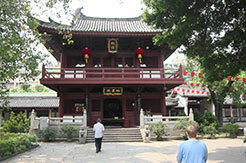 Zhejiangs’ capital, Hangzhou, former Quinsai, is described at length by Marco Polo, in his travel stories: "In this city, there is the palace of the king ... It is the biggest palace in the world ... It should be known, it is so great that it has ten thousand towers. Everything is surrounded by high crenellated walls, and behind these walls are the most beautiful and most delicious gardens in the world, full of the best fruit, with many fountains and many lakes full of fishes ... "
This province has a wide variety of landscapes, with agricultural or wooded plains, more or less eroded mountain ranges, diverse coastlines and valleys mixing city and nature. 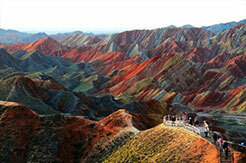 It has a deeply cut coast, which is the longest of China. The Danyang–Kunshan Grand Bridge in Hangzhou Bay is a 160-kilometre long bridge, the longest in the world. Employing 10,000 people, construction took four years only and cost about $8.5 billion ! This area was probably inhabited since the Stone Age, 50 000 years ago, many remains of the Neolithic are preserved. 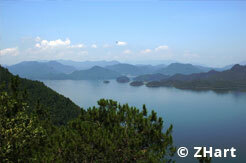 Zhejiang was the land of Yue tribes which lived in autarky. 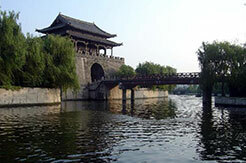 The Sui dynasty expanded the network which became the Grand Canal of China. The Canal transported goods from Zhejiang, through its centre Hangzhou to the North China Plain. Later great migrations followed. Under the Southern Song dynasty (960-1279), the prosperity of South China began to overtake that of North China. 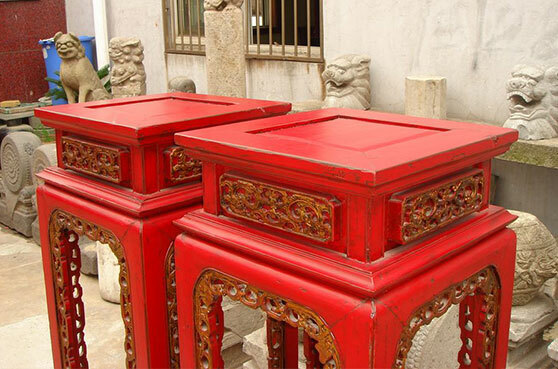 Southern Chinas’ culture and economy continued to prosper. In recent history, it was one of the first regions to open the port cities of Ningbo and Wenzhou to Western world. Zhejiang, however, has been an epicentre of capitalist development in China, and has led to the wrath of the Great Helmsman. Being mainly rural, Zhejiang radically changed when Deng Xiaoping came to power, in 1978. Benefiting from its proximity to Shanghai and its integration into the Yangtze Delta economy, Zhejiang has made itself the third richest province, became a thriving industrial centre and an economic model. The province also stands out for its advanced technologies in many areas, including aquaculture, cereals’ productions (rice crop in particular), and quality products - Zhoushan fishery, Longjing green tea – as well as sericulture (breeding silk worms). Han Chinese make up the vast majority of the population in Zhejiang province. There are also members of ethnic minorities, including She people and Hui Chinese. 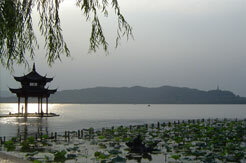 Zhejiang is mountainous and has therefore fostered the development of many distinct local cultures. Linguistically speaking, Zhejiang is extremely diverse. Most inhabitants of Zhejiang speak Wu, but the “Wu” dialects are very diverse. 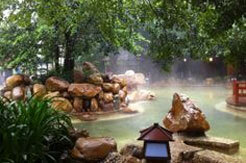 However, in Hangzhou, people speak Mandarin. One of the oldest intact wooden structures in Southern China. 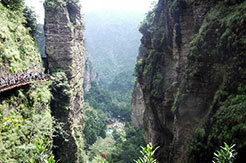 One of the four holy Buddhist mountains in China. A mountain important to Zen Buddhism. 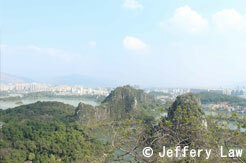 A mountainous scenic area North of Wenzhou. 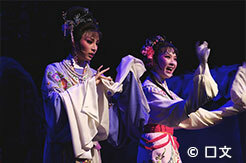 Is traditionally performed only by actresses only, in both male and female roles. 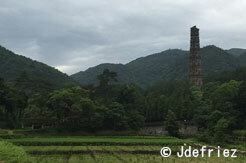 Jiangxi is a province, located in the southeast of China. 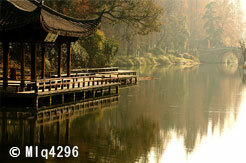 The population of Jiangxi is approximately 42 850 000 inhabitants. The capital city is Nanchang. Jiangxi shares a border with Zhejiang to the north, Fujian to the east, Hunan and Hubei to the west, and Guangdong to the south. In the 2nd century BC, this region was populated by the Yues. 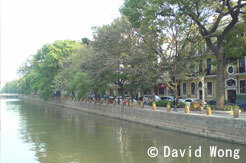 From the beginning, the corridor along the Gan River was one of the few easily travelled routes between North and South. This open corridor was a major asset and primary route for trade and transport… but also facilitated invasions, including that of the Qin, the first imperial dynasty of China (221 to 206 BC), which annexed it. It should be noted that Jiangxi became one of the earliest bases for the Communists and many peasants were recruited to join the Nanchang Uprising, which took place in Jiangxi on August 1, 1927. In 1935, the Communists started from Ruijin, broke through and began the 12,000-kilometre Long March, which resulted in the death of almost 100,000 men. Jiangxi has a humid subtropical climate. Average temperatures range from about 3 to 9 °C in January and 27 to 31 °C in July. Annual precipitation is 1,200 to 1,900 millimetres. Jiangxi is rich in mineral resources, leading the provinces of China in deposits of copper, tungsten, gold, silver, uranium, among others. Despite of that, Jiangxi is a rather poor province. Its main resources are rice, cotton and rapeseed. Paradoxically, the neighboring provinces of Guangdong, Zhejiang and Fujian are among the richest provinces of China. 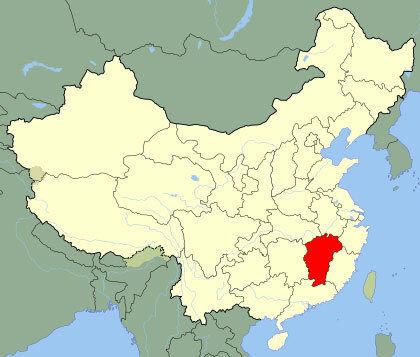 More than 99% of the population of Jiangxi is Han Chinese. Ethnic minorities include Hui and Zhuang. 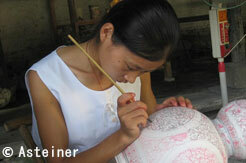 The official language is Mandarin, but a dozen dialects are also spoken. In the southern regions, there is another ethnic minority, Hakka, which speaks the eponymous language. 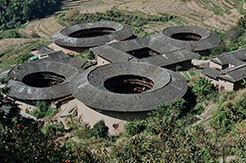 The mountainous terrain, large forest coverage and reserves of Jiangxi are home to mammals, such as muntjac, wild boars, civet cats and pangolins. Some tigers have been seen as well, which are sadly on the verge of extinction. 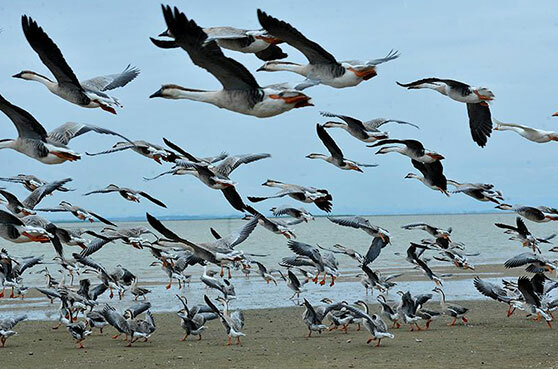 Numerous species of migratory and non-migratory birds are common, especially around the marshes of Lake Poyang. 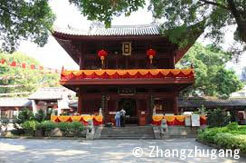 Known for its landscapes, and for the Donglin and Tiefo Temples, two important Buddhist temples. 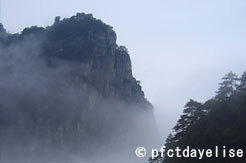 The Lushan National Park has been a UNESCOWorld Heritage Site since 1996. 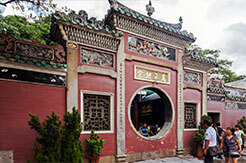 Which purports to be the birthplace of Taoism and hence has great symbolic value to Taoists. The region has many temples, cave complexes, mountains and villages. With 105 million inhabitants, Guandong is the most populated and richest province of China. The provincial capital Canton, called “Guangzhou” in Chinese, is located 3,200 km from Peking and is a main economic, cultural and political centre. Guangdong Province is also seat to four (out of six) special economic zones. Guangzhou, Shenzhen, Shantou and Zhuhai are the industrial and manufacturing heart of the province. 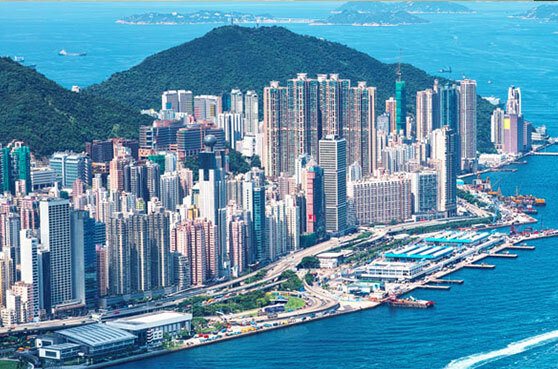 Hong Kong and Macau, which are special administrative regions, are financial centres endowed with an important autonomy. 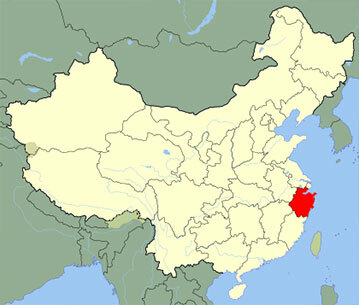 Together with Hong Kong and Macau, these cities represent 70% of the population in the megalopolis of the Pearl River. 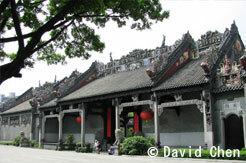 The present name, Guangdong Province, was given in early Ming dynasty. 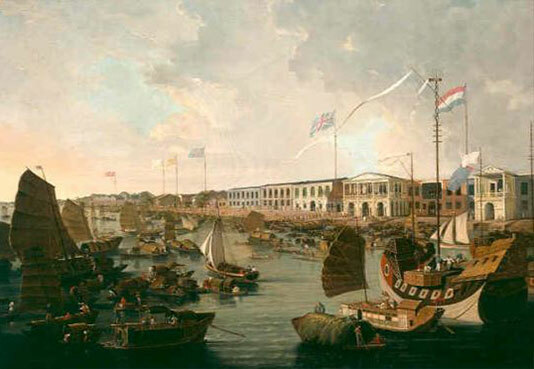 Since the 15th century, Guangdong has had extensive trade links with European merchants coming northwards via the Straits of Malacca and the South China Sea. 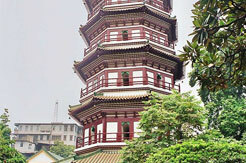 At the dawn of the 19th century, Guangzhou was an important port town, through which opium was traded. The First Opium War triggered the loss of Hong Kong, which was ceded to the British with the signing of the Treaty of Nanking in 1842, and went back to China in 1997. During the early 1920s, Sun Yat-sen founded a military academy in Canton (Guangdong). This academy notably provided the structure of the National Revolutionary Army. From 1926, during the civil war, the National Revolutionary Army led the Northern Expedition in order to reunify and pacify the country. 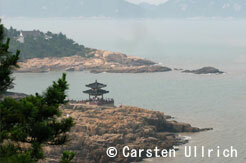 Guangdong faces the South China Sea to the south and has a total of 4,300 km of coastline. Its 2,122 kilometre-long river, Zhu Jiang (Pearl River), flows into a fertile delta, which is filled with hundreds of small islands. 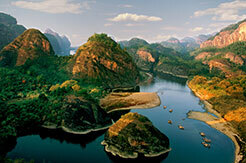 Located at the southern tip of China, Guangdong is crossed by the Tropic of Cancer. It has a humid subtropical climate, though nearing a tropical climate in the far south. Winters are short, mild, and relatively dry, while summers are long, hot and very wet. Guangdong's trade vocation radically changed when Deng Xiaoping came to power in 1978. Following his reforms, economic development policies encouraged industrial development of the province, in China and in the world. The provinces’ development over the past decades has rested on following pillars of industrial growth: textiles, foodstuffs, metallurgy, electronic machinery and advanced technology. 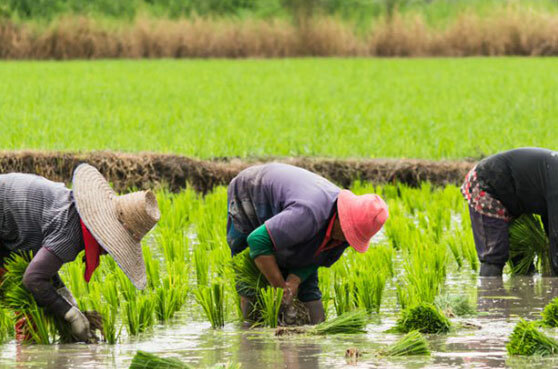 To this, Guangdong is in the process of adding forestry and water resources, cereals’ and fruit production, as well as fishery. These highly prized industries make that the export-oriented economy of this region, has been following an exponential curve. The majority of the province's population is Han Chinese and speaks Cantonese. This singing language has seven to nine intonations, while Mandarin has only four, even though the sinograms are the same. There is a small Yao population in the north. 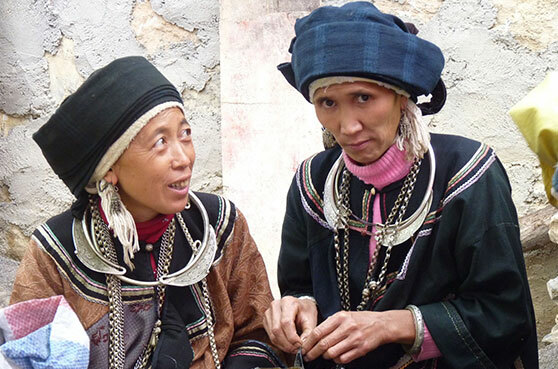 Other smaller minority groups include Miao, Li, and Zhuang and speak a big variety of dialects. 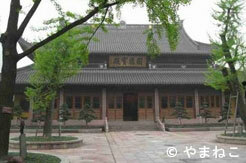 Traditional house of the Qing dynasty.